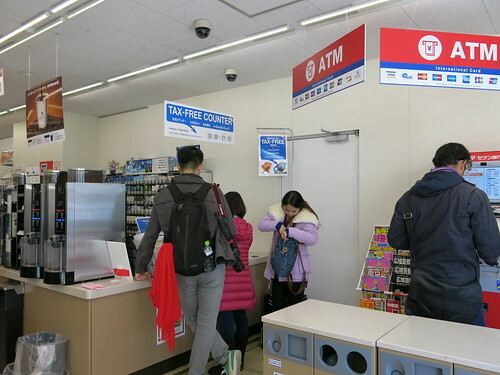 In addition to Seven Eleven convenience stores in Asakusa and Seiin (Kyoto), Family Mart convenience store has also started offering tax free shopping for foreign visitors on March 23rd in the following three locations: Sunshine City Prince Hotel in Ikebukuro and two stores in Kansai International Airport Terminal 1 (2F and 4F). At those shops, visitors from abroad can get out of the 8% consumption tax by showing their passport at the cashier. To be eligible for tax free shopping, you must spend more than 5,000 yen in total for consumables such as food, drinks and cosmetics. You are not supposed to open the packages until you leave Japan. Although the prices in convenience stores are usually higher than in supermarket, they sell the newest snacks that are great for souvenirs! Convenience stores are where you can get the “seasonal” or “limited versions” of certain snacks. It’s interesting enough just to see what are on the shelves. So as you can imagine, convenience stores in the airport would be the perfect place for your last minute shopping before leaving Japan but remember that you cannot bring in liquid items exceeding 100ml on the plane with you. If you’re going to buy liquid items such as drinks and cosmetics, make sure you put them in the check-in baggage!